Dutch family of painters and draughtsmen. Although they came from a non-artistic background, the brothers Jurriaan Andriessen and Anthonie Andriessen (1747-1813) became successful painters, specializing in supplying painted wallpapers, which they made at their factory in Amsterdam. Jurriaan also produced work for the theatre. Both brothers were active in the Amsterdam Tekenacademie; their pupils included some of the best-known 19th-century Dutch artists, such as Wouter Johannes van Troostwijk, Hendrik Voogd and Jean Grandjean, as well as Jurriaan s son Christiaan Andriessen and granddaughter Cornelia Aletta van Hulst. From 1754 to 1758 Jurriaan Andriessen was apprenticed to Antoni Elliger and from 1759 to 1760 to Jan Maurits Quinkhard. Although he produced a few allegorical history paintings, his most important work was for the Amsterdam wallpaper factories, making painted wall-coverings for manufacture, mainly for private residences. He began as an assistant to Johannes van Dregt (1737-1807) but later worked with his brother Anthonie and Izaak Schmidt (1740-1818) in his own factory. He also attended classes two evenings a week at the Amsterdam Tekenacademie, where in 1766 he won first prize and became a teacher himself. The same year he joined the Guild of St Luke; by 1794 he had become co-director with Cornelis Buys of the Tekenacademie. 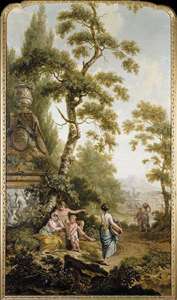 See more details about "Arcadian Landscape"